Your Hummingbird Stories. Submit Your Story Here. Since hummingbirds are faithful friends, returning to the same feeders year after year, many of us become attached. We sometimes give them pet names. Please remember that hummers are wild birds that need to live outside. Some of us have a more scientific interest in the study of hummingbirds. Others just love to watch. Whatever your interest, we would all enjoy your stories. Do you plant a hummingbird garden? What flowers do your hummingbirds enjoy most? Have you ever seen a hummingbird nest? Please use the form below to submit your Hummingbird Story. After another great season of hummingbird activity, I cleaned and put away my two feeders until next spring. There had not seemed to be any nectar gone for a few days and the nights had been chilly. When I pulled into the driveway after work, late afternoon, the next day, a hummingbird hovered in front of my windshield as soon as I turned off the car. I counted to ten. Still there. "I thought you guys had already left. I'll make new nectar and put the feeders back up"
Then he was gone. After hanging the feeders, two hummingbirds came, one to each feeder. I left them to it in the still warm afternoon. This winter I was so excited because I knew my best friend (Benny the hummingbird) was coming. Well in November I looked outside every single day,but still no Benny, November passed, no Benny. December came I put out lots of new plants my mom and i bought, I put out hummingbird feeders, nectar cups and 2 Hibiscus plants. December passed no Benny. when January came I began to worry, my friend said "Amanda your worrying as if Benny were a human maybe it was his time or he found a home full of plants with nectar don't worry maybe next year he'll come. Did you know that a Praying Mantis could catch & kill and hummingbird?? I sure didn't. We found a Mantis clinging to the top edge of our big feeder, and he was busy eating a hummer! Five days later, the Mantis was back on the feeder, but we killed it this time. Sure sorry to lose one of our many hummers this way. I live in the costal Pacific Guanacaste area of Costa Rica.I have a hummingbird feeder on my front porch and usually enjoy my morning coffee watching the antics of a variety of species enjoying their breakfast. I have a purple flowered plant growing approx 20 feet beyond my feeder. Those flowers attract a variety of butterflies and moths. A few weeks ago I spotted an unusual visitor to those flowers. A closer inspection found that a tiny black and white(no colors) hummingbird was feeding on those flowers.He was approx 1 1/2 inches long (including his beak). At first I thought it was a black carpenter bee or maybe a hummingbird moth........but no it was a hummer ! I grabbed my video camera and captured some pretty good shots of it. I have not yet found anyone who knows anything about him. If anybody can help me identify this unusual little guy please let me know. In the mean time I will try and figure out how to download the movie. (Ropesville, Texas 79358) 2009 we had spent a week at Ft. Davis in September. We had several Hummers coming up to our feeder hung close to our motor home. On our last day there, I had put up everything getting ready to pullout to head for home. I left the feeder to the very last. I finally brought it in and had left the door open while I emptied the feeder into the sink. I looked up and one of the Red Throats we had been feeding had came into the motor home hovering between the two driver seats. I started to walk toward him and talking to him. All of a sudden, he went out the door. I thought we had seen the last of him. I went ahead started the motor and pulled forward to hook up the Jeep. "WHERE DO YOU THINK YOU ARE GOING, STOP!!" He stayed there until we got to the highway. It made us sad and we wanted to unhook and stay another peaceful week. 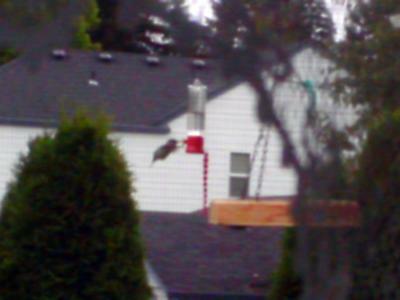 This is the first full year we have put out hummingbird feeders in our Vancouver, Washington home and have named a few distinctively marked regulars in the mix of hummers we get year around here! To help our new backyard hummingbird decor theme, we've collected some hummingbird sun glass, wind ornaments, windchimes (the decoration bird being a huge crow-sized hummingbird which I painted in the native Anna's hummingbird pattern, and a colorful garden flag with what is supposed to be a Ruby Throated hummingbird sipping from a bunch of bright red flowers. Our backyard hummers entertain us by sometimes batting the ornaments around with their beaks and then watching them move. One bird even attacked the wind chimes "bird." repeatedly jamming its beak into the much bigger inanimate bird's neck. This particular bird is my favorite, a curious young Anna's male called "hummy." Hummy noticed my garden flag almost as soon as I put it out. He flew over to it and hovered in front about a foot in front of the flower-hummingbird illustration, eyeing, in turn, the "hummer" and then the flowers. Hummy moved laterally from one side of the flag to the other, left to right, as if he were near-sighted and reading the newspaper. I was in stitches suppressing laughter that would have scared the little bird away. After about twenty seconds of side to side hovering, Hummy satisfied himself the flag wasn't a meal or the bird on it a threat and zipped on to more real flowers. Have A Great Story About Hummingbirds?